Are you a messy person? Not a gross person, like the kind that lets food sit out until it molds and attracts flies, that kind of person is beyond the scope of this article, but a messy person who is continually battling clutter? We’re going to look today at the three most significant causes of mess, and how to overcome them. Mess has an amazing ability to become normal quickly. It starts with one or two things that feel like they should be left out, because you use them on the daily and it’s inconvenient to get them out again and again. Then it’s something that you used once and plan to use again soon, but don’t. Each thing you leave out becomes a part of the area in your brain, and then the next thing goes through the same process, and pretty soon you have to move a cutting board to have enough room to set up the blender. This is the most insidious cause of mess, because by its very nature it’s very hard to catch it until some outside force points it out to you. Keeping it from happening requires planning ahead and doing something that literally no one ever thinks should be necessary. First, you have to clean up entirely, until everything has a place and is in that place. Then, you have to take a picture of the space as it looks when everything is away. If you can, get that picture laminated or put it in a sheet protector or something. Once you’ve got a permanent visual record of what the space is supposed to look like, set a daily alarm for yourself, and every day for two weeks, get out that picture and spend however long it takes to make sure that everything looks just like it does in that picture. Two weeks makes a habit – but keep the picture just in case. 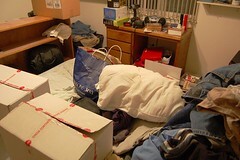 Of course, there’s a good chance that you have straight-up too much stuff for the amount of place at your disposal. If that’s the case, you really only have two options: you can get rid of some stuff, or you can create more space. As a renter, the likelihood is that you can’t just install a bunch of shelves or add a shed or something, so you have to be clever with the space you already have. Look through your storage areas, and look for space that is legitimately unused. (“Legitimately” because there’s a lot of empty space that is necessary empty space, like the area above the stuff on the bottom shelf that you need to reach over the front row and get to the back row.) If you find any actually usable space that isn’t currently being used, check your local dollar store or big-box store for cheap (usually wire) racks that can add useful shelving to the currently-useless space. If you don’t find any, consider a slightly more significant option, like installing a Lazy Susan or a sliding shelf or drawer that can allow you to reach that stuff in back without having to have the empty area above the front row. Ultimately, though, you should always consider the option of putting a bunch of stuff you haven’t used recently in a box and sticking it in a little-used corner somewhere. Put a list of contents and a date on the outside, so if you happen to need something in it, you know where to look – but if you notice that six months has gone by and you haven’t used X thing, sell, donate, or trash the thing. It might be a challenge, but your mess-fighting efforts will thank you.